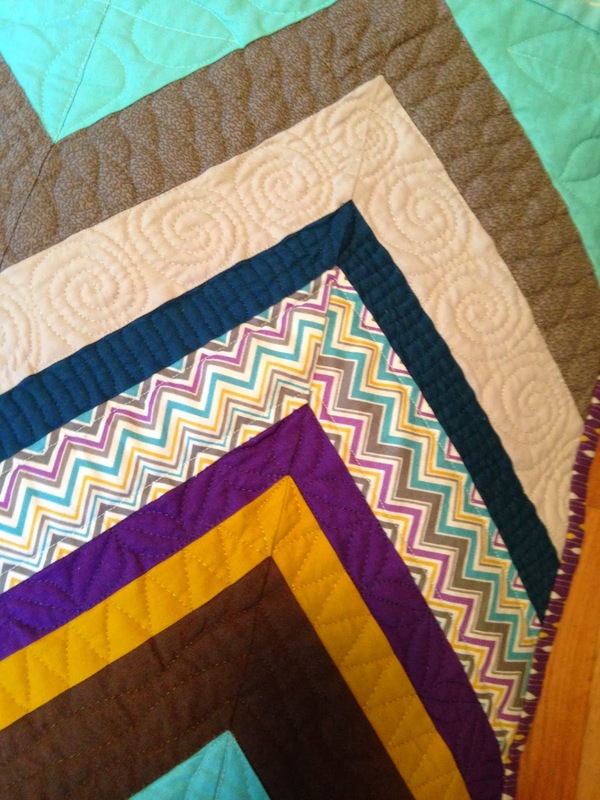 The quilting production slowed a bit in 2013 due to travels, family changes and shoulder surgery. But I did manage to find a bit of time to complete a few projects. 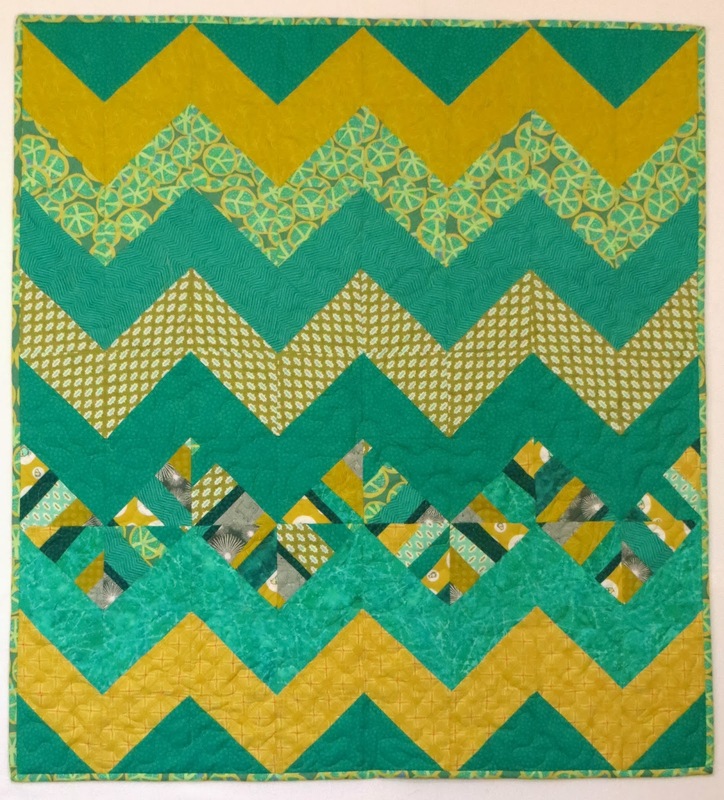 While we were in Sisters during Christmas 2012 Anna chose this Valori Wells quilt pattern and fabric for a double bed quilt. 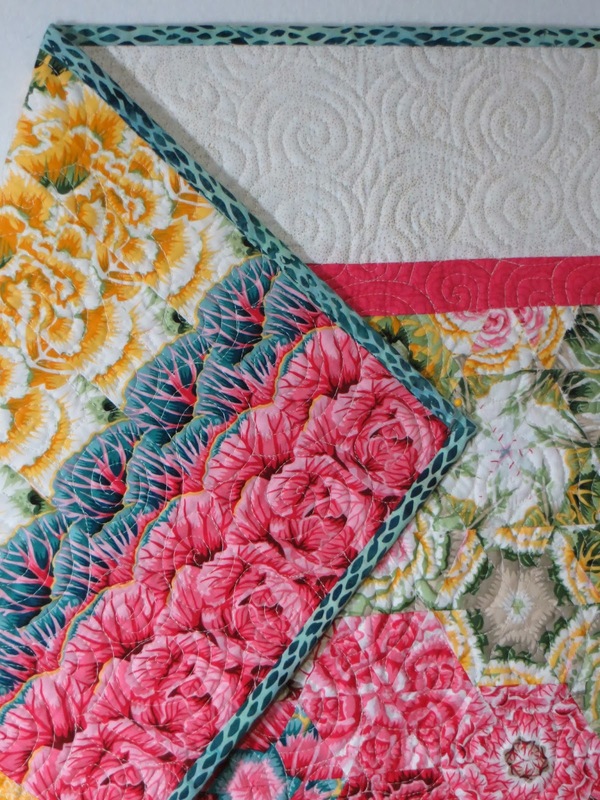 The quilt provided a good opportunity for me to get some more practice with free motion quilting. 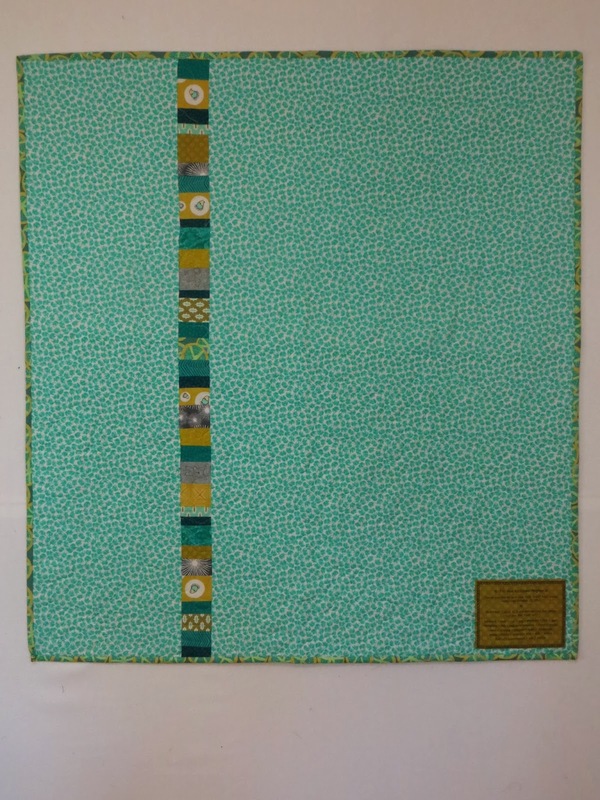 My sister-in-law Connie had created a table runner using the One Block Wonder technique and asked me to do the quilting. 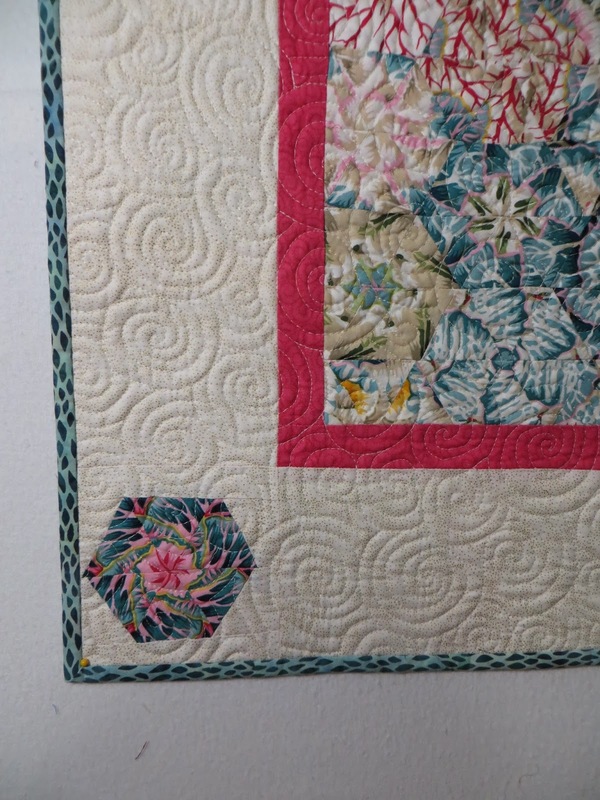 For a novice quilter, Connie did a great job on the piecing and arranging of the hexagon blocks for the final design. 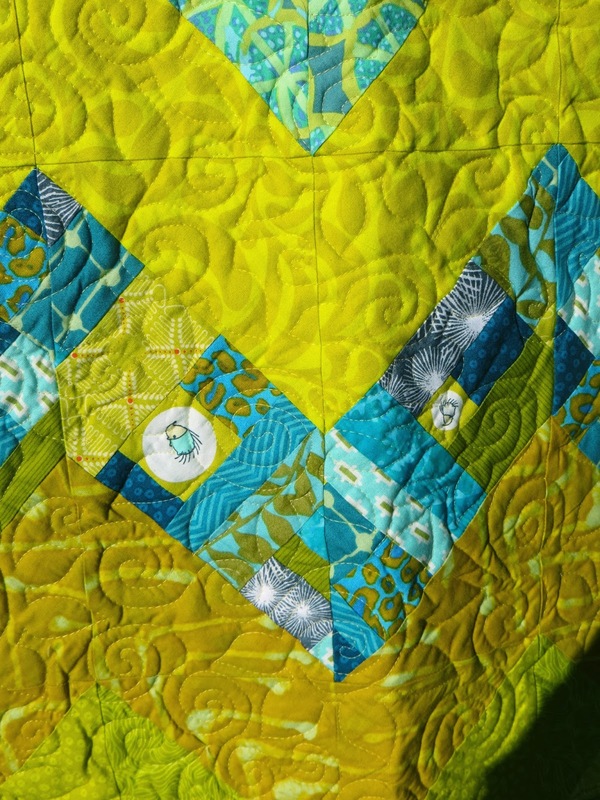 I like the way the quilting shows on the more plain areas of the piece. Using leftover equilateral triangles, Connie sewed matching triangles into strips and then pieced the strips together for the backing. Too bad I didn't get a photo of the overall backing design. 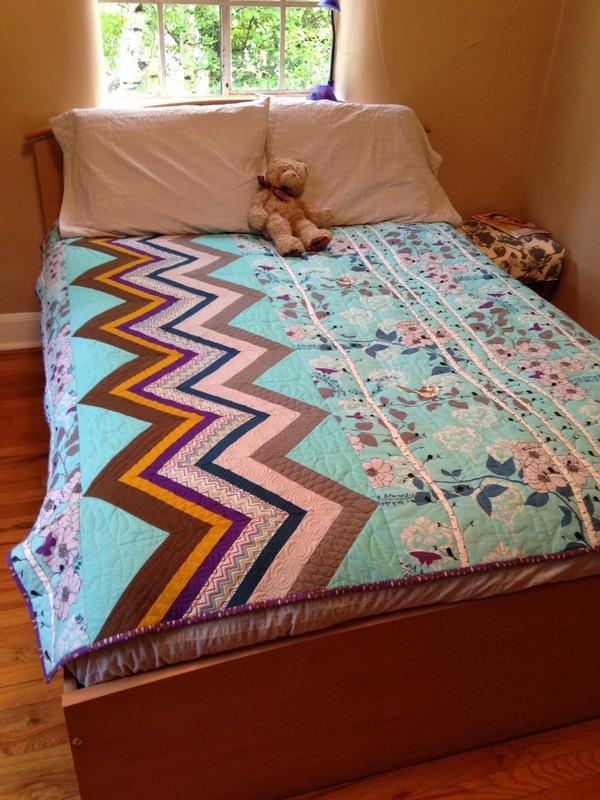 Ava's quilt was the first chevron quilt I made. The colors were inspired by some hedgehog fabric I saw at Cool Cottons. The lighting was not right when I took the photo so the colors are dulled somewhat. 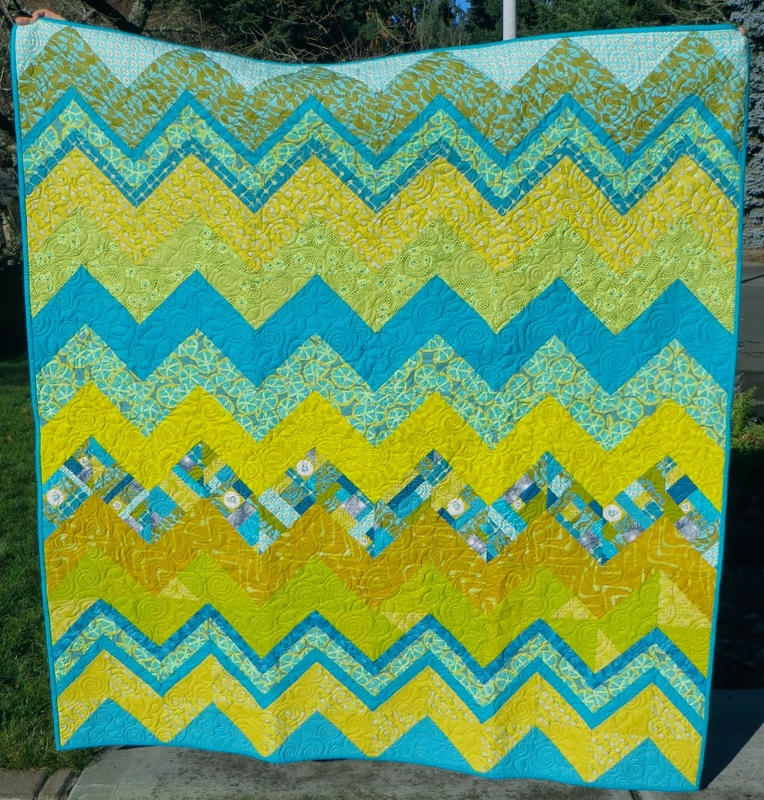 For one of the chevron stripes I pieced the fabric to help unify the design. 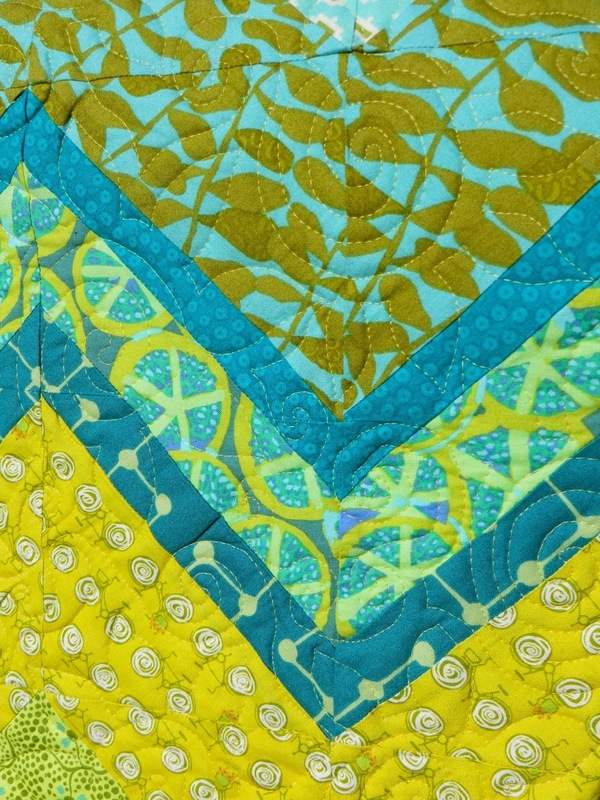 This detail shows a bit of the hedgehog fabric from Cool Cottons along with the flannel aqua elephant backing (also Cool Cottons) . The gray dog fabric was also used in the sleeping bags I made in 2012 for Ava's brothers, Brett and Davis. The label. This time I quilted an animal alphabet. Using animal outlines from different free online sources, I printed them out to the desired size and pinned them onto the quilt. 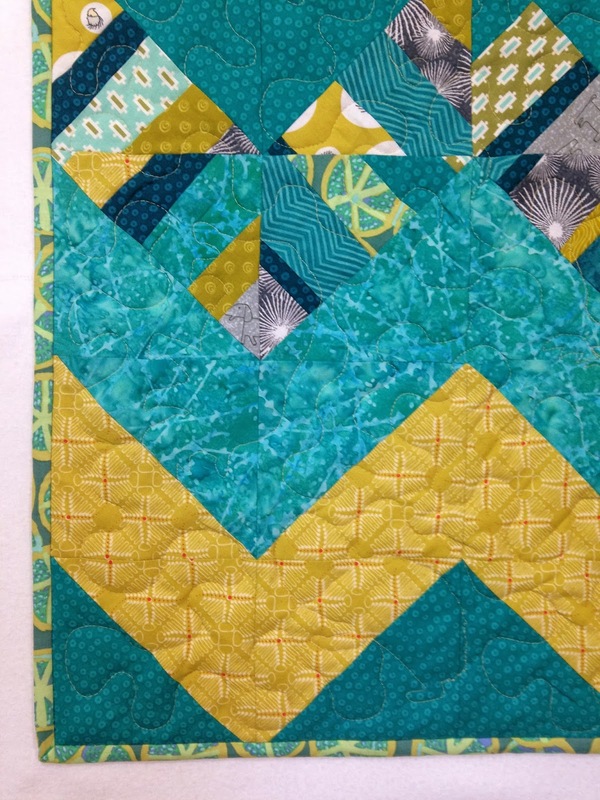 Using the shapes as a template I quilted around each shape. 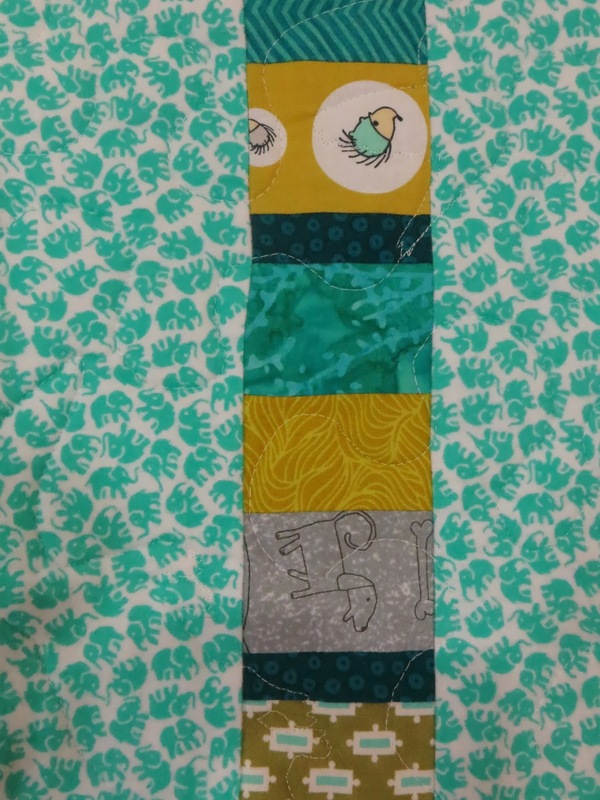 A little constrictive but it did insure that I would be able to fit all 26 of the animals onto the quilt. 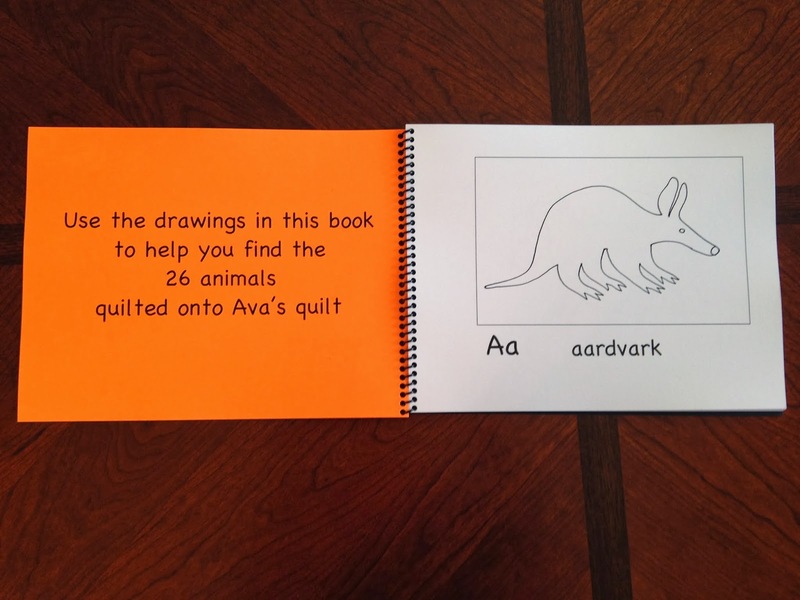 After completing the quilting I thought it would be a good idea for Ava (and her two brothers) to have some way of helping them identify the various quilted animals (what is a zorilla anyway?). 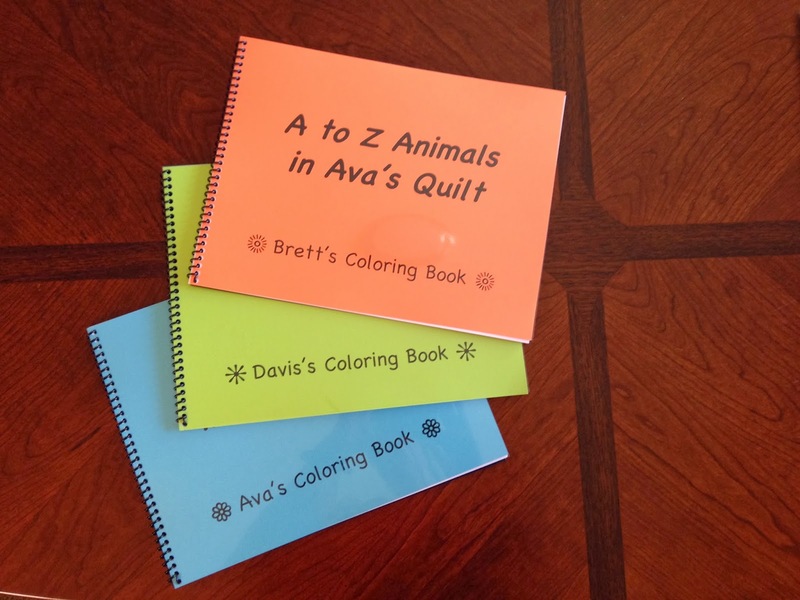 I created three coloring books for the kids utilizing the same animal outlines I used for the quilting. And here is little Ava catching a nap outdoors on her new blanket. Here's what I put together in the workshop. 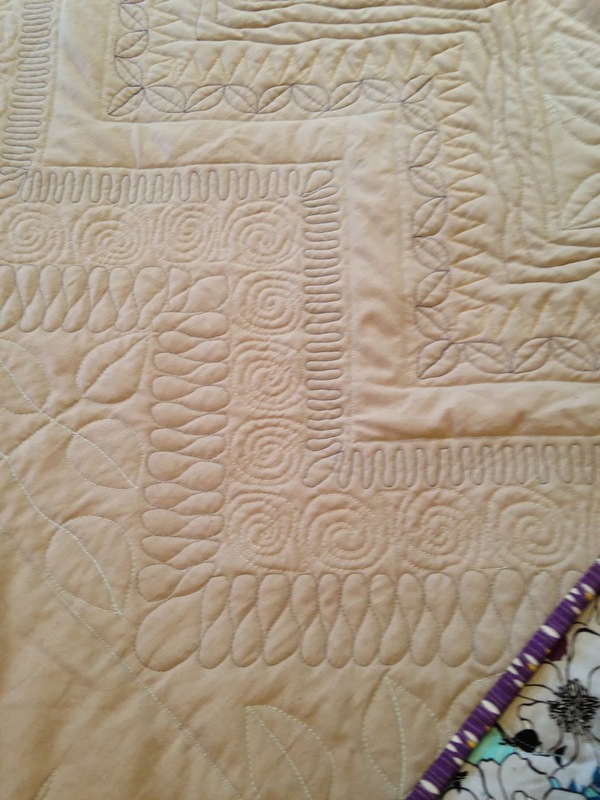 Hope to get it finished in Jan 2014 (quilted, backed and edged). I have an idea for another piece based on what I learned here. 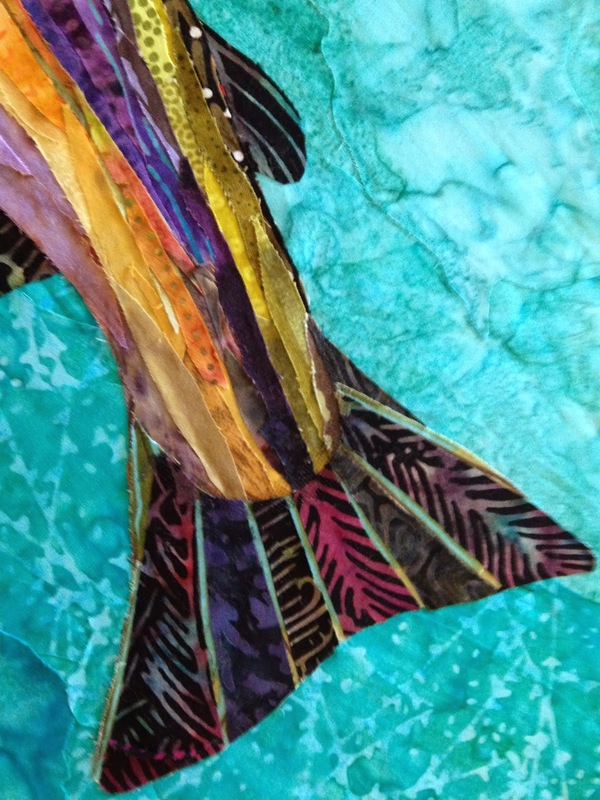 It was an interesting process - collage with fabric - and a great way to utilize all those itty bitty leftover scraps of fabric. 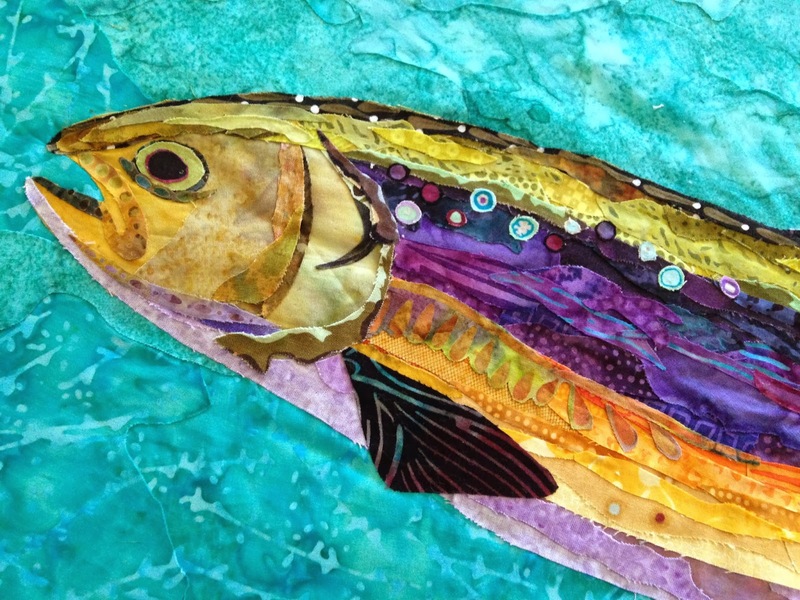 Not sure just yet where I will go with this trout from here. It is looking very static. 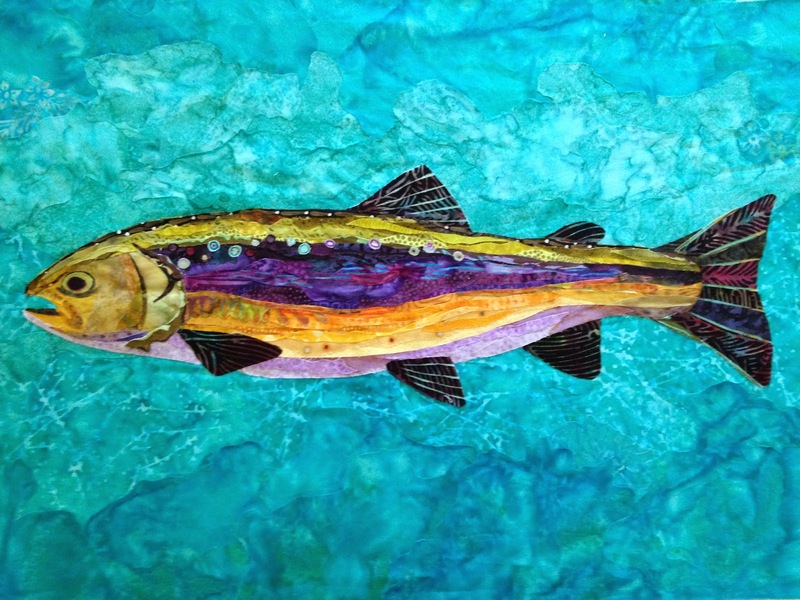 I need to spend some time thinking about a way to add movement to it (not easy when it looks like a stuffed and mounted fish). 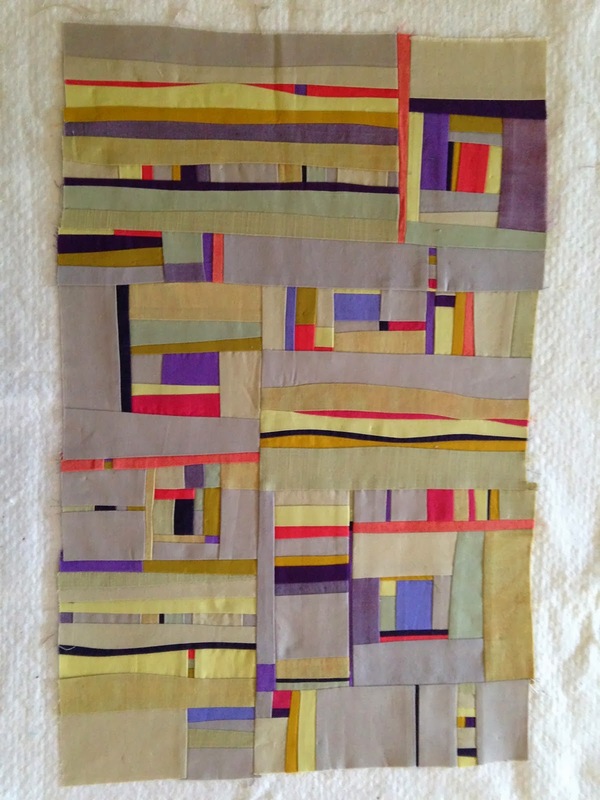 Anna liked Ava's quilt design and colors so much that I decided to make a lap quilt for her.